With TestChest, Organis GmbH created an innovative full physiologic artificial lung that provides a breakthrough in mechanical ventilation training. TestChest promotes a safe and controlled environment free from risks of the clinical environment and eliminates the necessity of training on animals. TestChest® has unique features in terms of representing complex breathing patterns through programmable driving pressure (p0.1) and respiratory rate. Muscular activity, important criteria for weaning, can be easily simulated. TestChest® has variable resistance and its inspiratory compliance is a non-linear function that can be represented as S-shape curve. 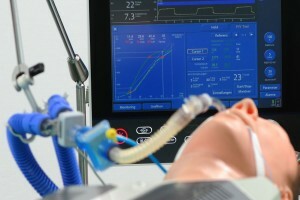 TestChest® has a programmable FRC and allows the simulation of lung collapse and recruitment as well as hysteresis of the pressure-volume loop. TestChest® realistically replicates gas exchange and hemodynamic responses. The communication with TestChest® is effectuated via standard TCP/IP network connections. 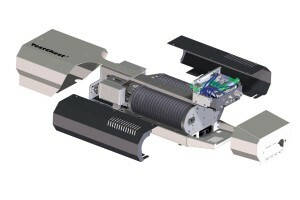 TestChest® includes a user interface software that runs on any windows PC to be connected via Ethernet interface to the simulator.  Selection of preconfigures patients scenarios.  Selection of preconfigured spontaneous breaths.  Setting of parameters for beginners and advanced users.  Storing new patients scenarios and saving the records in a CSV file. pressure sensors as well as a temperature and oxygen sensors. 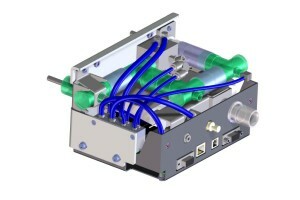 A mass flow controller for CO2 delivery, programmable dead space and leakage are available. adult patient. 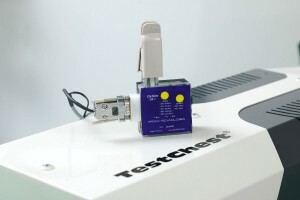 TestChest® features a detachable calibration module, which makes it accurate for years of use. 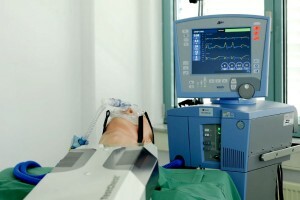 TestChest® is not only limited to training as it is further intended to check the functionalities of ventilators, CPAP devices and other respiratory support devices in laboratories facilities.